In most homes with kids, macaroni and cheese has yet to be edged out as one of the most loved family meals of all time. In this recipe, I used a Monterey Jack blend, a cheddar, some mozzarella and some provolone. The addition of evaporated milk gives the dish extra richness. Then I baked the mac and cheese in muffin cups, which turn out to be the perfect single serving size. Over the years I have definitely found that many kids love small individually portioned meals; there’s just something appealing about a dish that is just the right size. Keep experimenting with different shredded cheeses – the dairy aisle is filled with choices, and it never gets old to develop a new mac and cheese for your family. Preheat the oven to 375. 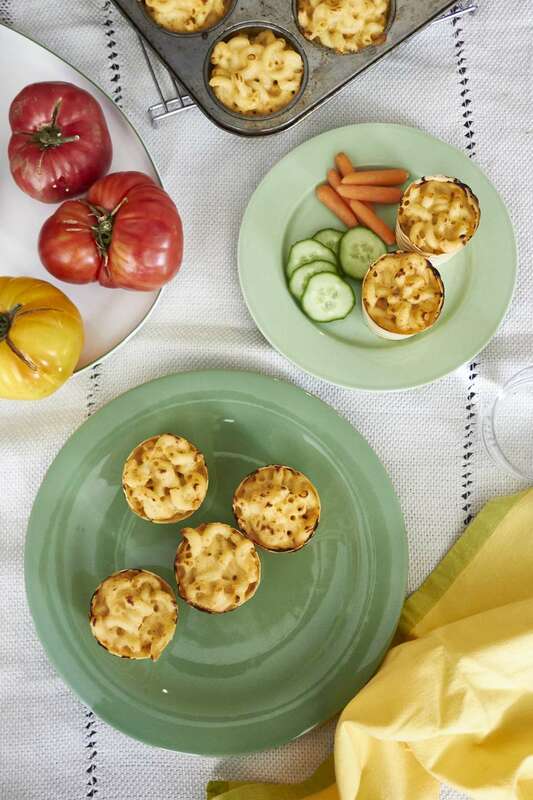 Line 24 regular-sized muffin tins with paper liners and spray with nonstick spray (you can also just bake the mac and cheese muffins directly in the muffin cups, sprayed first with nonstick spray). Bring a large pot of water to a boil, and salt it generously. Allow the water to return to a boil and cook the macaroni according to package directions. Just before the pasta is finished, remove about 3/4 cup of the cooking water. Drain the pasta. Melt the butter in the same pot you used to cook the pasta in, over medium-high heat. Add the flour and cook over medium heat, stirring frequently for 2 minutes, until it starts to color. Add the evaporated milk and whole milk, then the reserved pasta cooking water, and bring to a simmer, stirring frequently until it thickens slightly after a few minutes of simmering. Stir in the mustard and salt, and then add all of the cheeses, stirring until the cheese is melted. Add the cayenne, then return the drained pasta to the pot. Stir well until the pasta is well coated with the cheese sauce, then scoop the macaroni and cheese into the prepared muffin cups (about 1/2 cup per cup), filling them to the top, and bake for 20 minutes, until the tops are golden brown. Let the macaroni and cheese muffins cool in the tins on a wire rack for 5 minutes before taking them out of the tins and then serve them hot or warm. You could use a mixed blend of cheese, such as Italian Blend or Mexican Blend, instead of combining your own cheese selections, which is a great shortcut. Fill the muffin tins with the macaroni and cheese mixture up to two days ahead of time, and store covered in the fridge. Either bring to room temperature before baking or add another 5 minutes of baking time to the muffins if you are baking them straight from the refrigerator. If you want the muffin cups to have tops that are a bit more browned, run them under the broiler for 1 or 2 minutes at the end of the cooking time.